This is the Liebherr 630EC-H40 Litronic, made by Conrad. 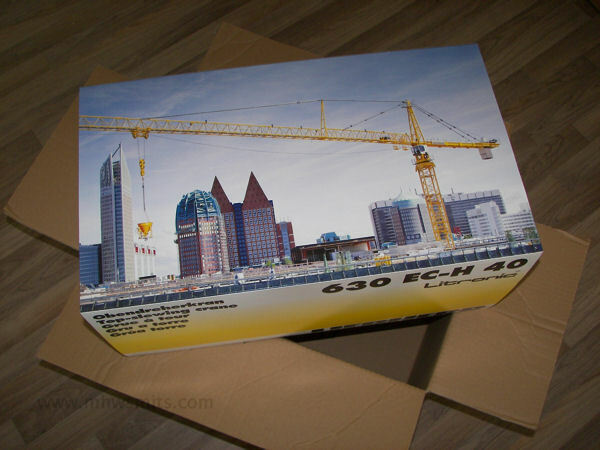 This is the first 1/50 tower crane produced by Conrad and that they are proud of it shows from the supplied brochure, which mentions words as ‘outstanding’ and ‘excellent’. The model is packed in the well-known polystyrene box with cardboard shell. As usual, this box consists of three layers filled with parts. In the first layer the jib, counter-jib, the tower end and some separate walkways can be found. 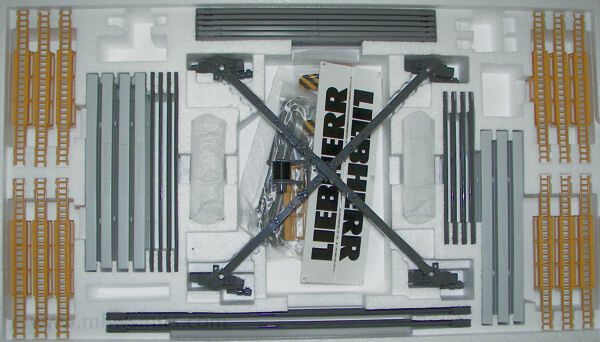 The tower sections, cab and the climbing equipment are in the center part of the box. 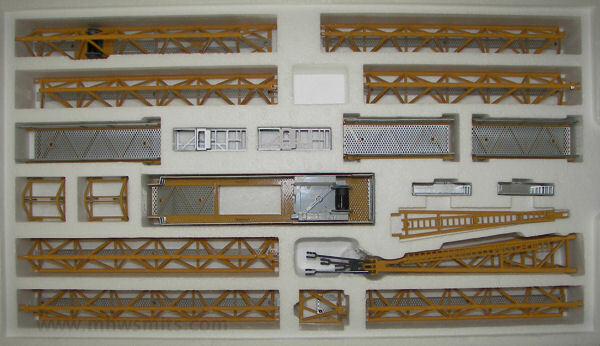 The undercarriage, tracks, ballast, separate caged ladders and some bags with small parts are in the bottom tray. In the first bag are the plastic bolts. 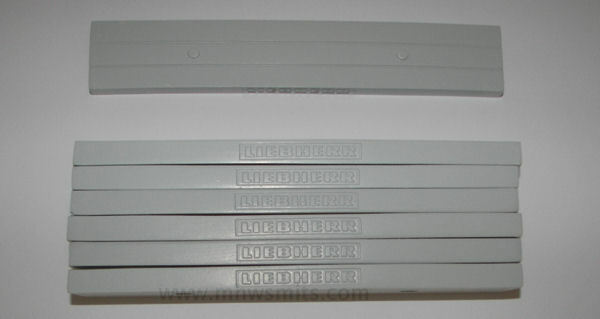 The model comes with six identical strips with three different sizes of bolts, and one strip with two sizes of bolts. The next bag contains all plastic guying rods. 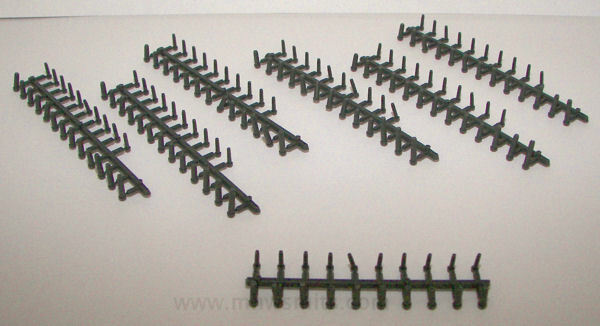 These differ from the rods used on other Conrad models, and must be connected to each other with plastic bolts. These new guying rods appear to be more rigid than the usual Conrad rods. A separate ladder, two separate ladder cages, two hoisting ropes, a lifting chart, and a Liebherr mechanic (also 1/50) are supplied in a third bag. 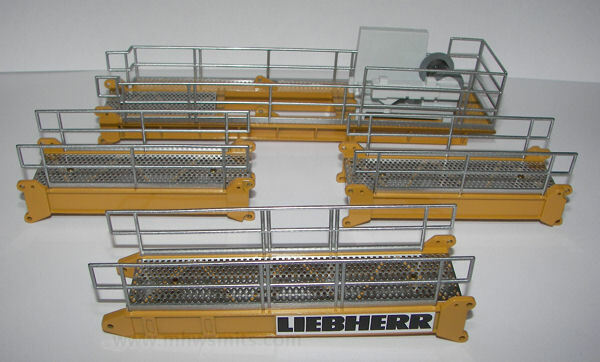 The mechanic is made by Preiser, and is also available in a set of Liebherr mechanics, i.e. at the Liebherr Shop. The last bag contains the ready mounted double hook and a separate hook to be used on a single trolley. 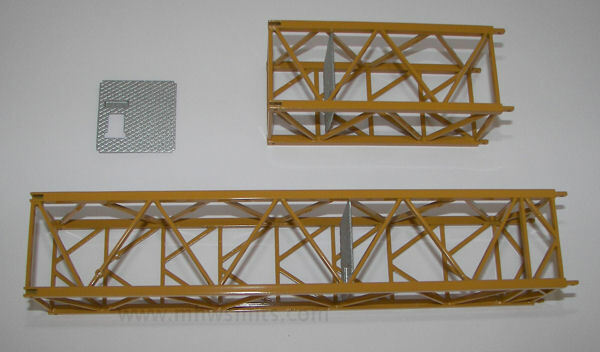 The track elements are supplied as separate parts. The metal tracks have fixed end blocks at both ends, and thus can't be extended. 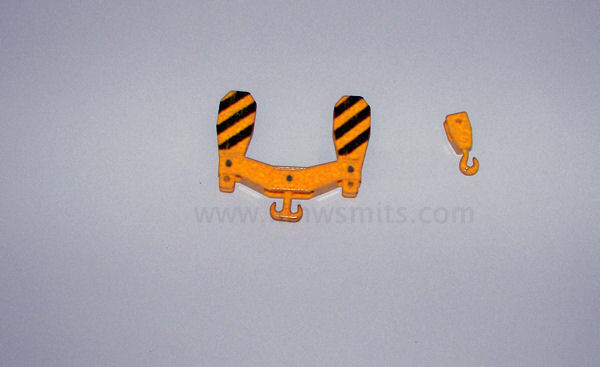 The crane can move only approximately 4 cm (1.5 inch) on this piece of track. 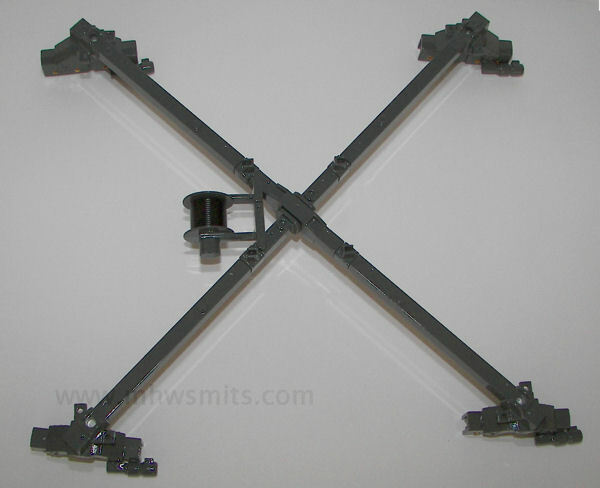 The crossframe of the undercarriage comes pre-assembled, but by removing one screw can be split in two parts. Unfortunately this also splits the cable drum. 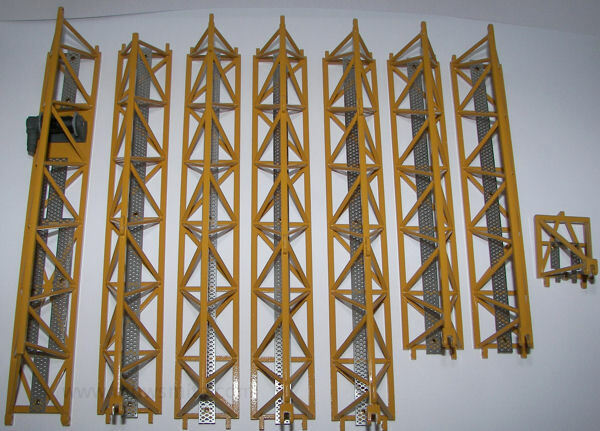 The model comes with seven pieces of base ballast slabs: six to be used on the undercarriage and one to use as load with the two supplied hoisting ropes. These ballast slabs look quite heavy, but since they aren't made out of metal they weigh just about nothing. These plates therefor have completely none influence on the stability of the crane. The first tower piece has twice the length of a normal piece. Because this first towerpiece also needs two ladders, the second platform is supplied separately, and has to be fixed with bolts after mounting the caged ladders. The cab has a pre-mounted platform on both sides. These can simply be pulled of to use the cab as load on a flatbed trailer. 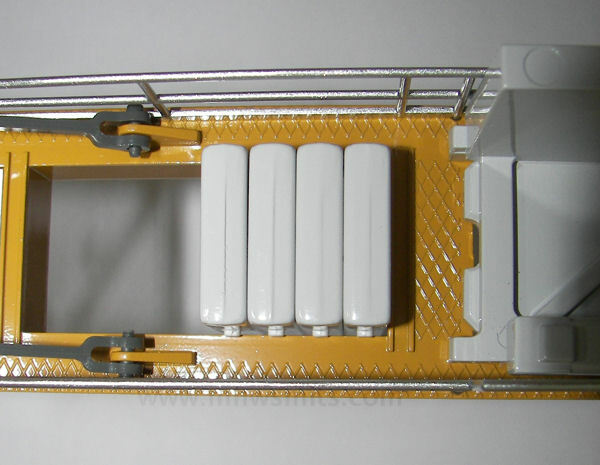 The electric drives of the slewing gear are made from plastic and could have been more detailed. 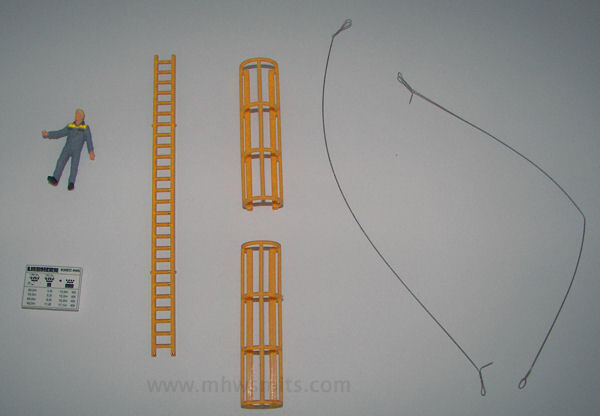 The climbing equipment is made out of one piece wit a pre-mounted platform. Because this platform can't be taken of the climbing frame, this part is not suitable to use as load on a truck. The climbing mechanism is fully functional, but the frame sits too loose around the tower to be shown in use. The climbing mechanism just slips of the tower sections. 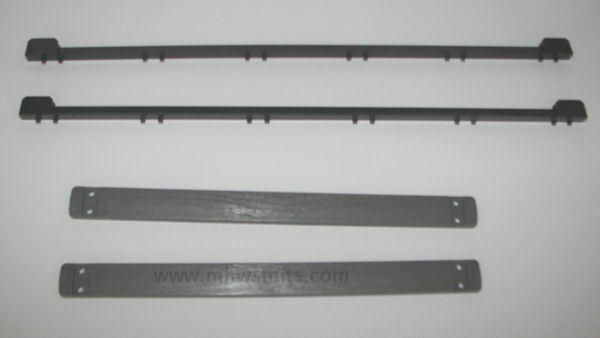 The counter-jib consists of four parts. Depending on the length of the jib, the counter-jib is assembled using two, three or four parts. Unfortunately it isn't possible to set up all possible configurations, because of the limited number of the various lengths of guying rods supplied. 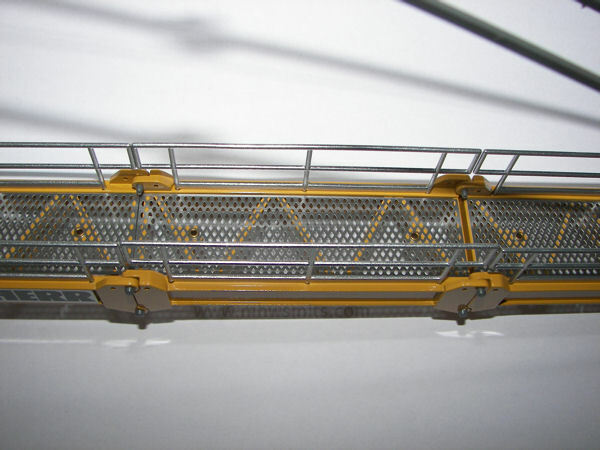 All parts have a metal perforated walkway, which has a more realistic look than the cast metal walkways as used on other parts on the model. 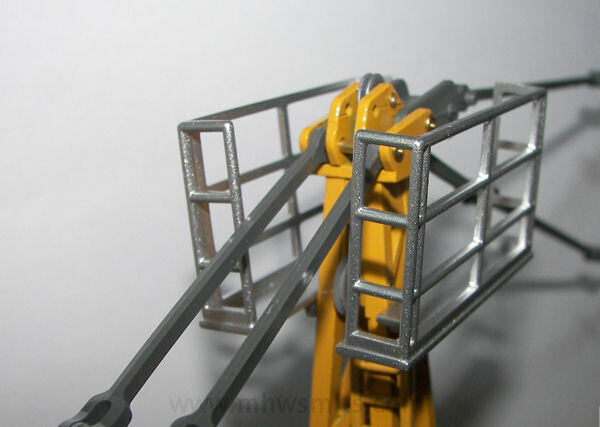 The added realism of these metal walkways is slightly made undone because Conrad riveted the to the jib parts instead of glueing them. The cabinet next to the winch is a smooth block of cast metal, and could have been more detailed. The walkways on the counter-jib all nicely fit without gaps between the sections, apart from one connection. There is plenty of space to hang the ballast pieces. The notches on the ballast pieces are so tiny that the ballast just barely keeps hanging. 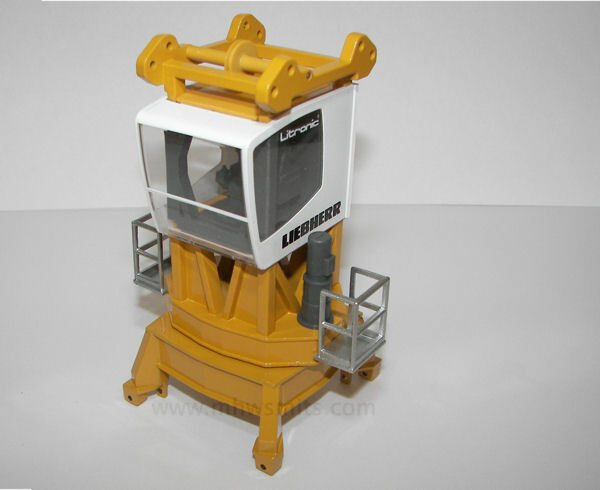 If the model isn't fully ballasted (as pictured) you therefor have to be very careful that none of the ballast slabs falls from the crane. The jib consists of eight parts. 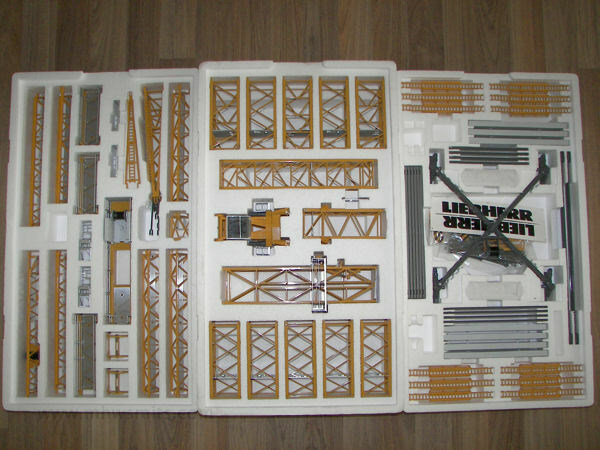 The first two parts (in the picture at the left) are taller than the other parts, just like with the real crane. The jib parts also have perforated metal walkways riveted on. The jib can be configured in various lenghts. The last two parts can be removed without any problems, but when removing more parts you have to change the configuration of the guying rods. Like with the counter-jib, possibilities are limited because of the lack of additional guying rods. The first part of the jib has a winch mounted. It's fully functional and has rope on it, but it isn't used on the model. In reality, this winch is used to move the trolleys. The platforms on both sides of the tower end are a very loose fit, and drop out at the slightest movement of the crane. I have fixed this with a drop of glue in the notches. A coat of clear varnish is also possible, but has to dry a bit longer. The platforms are now also level. The model comes with a small pile of paper. Apart from the already mentioned brochure, there are three manuals. First there is the multilingual assembly guide, which shows the assembly globally in eight steps. On top of that there is an additional German/English and a French/Italian detailed assembly instruction supplied which also explains where the different bolts and guying rods must be used. Why Conrad supplies all these separate documents instead of one complete guide is unclear to me. 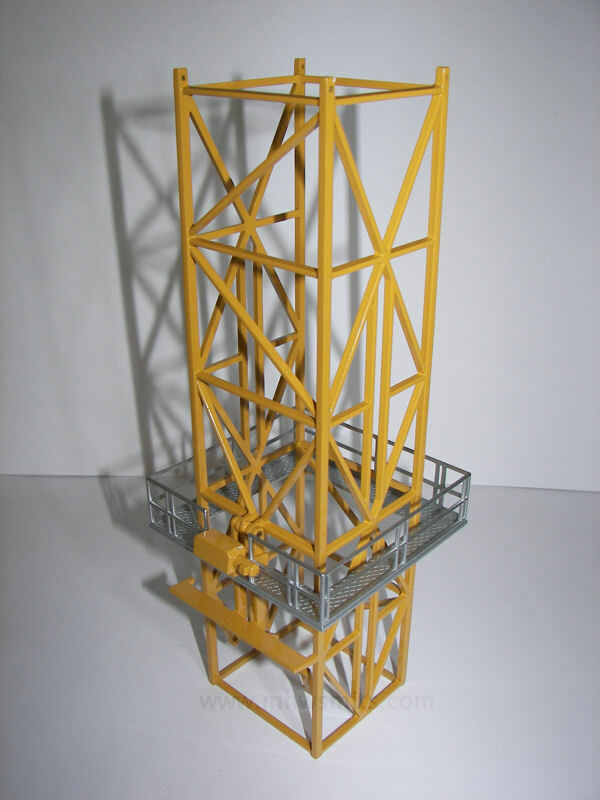 This first 1/50 tower crane made by Conrad is in no way a disappointment. But there are clearly details on which the model could be improved. It should have been nice if Conrad used the winch to move the trolleys, but the biggest let down on the model is the lack of additional guying rods to enable more jib configurations. Not everybody has the space available to show the full-size crane, and for those people it would be a big plus if they could configure the model with a shorter jib and counter-jib. 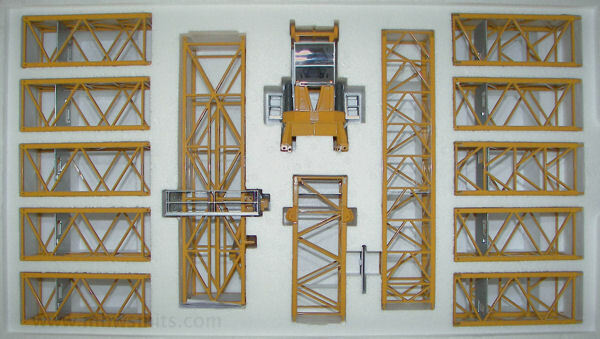 Because Conrad supplies ten tower sections it's possible to set up an impressive scale model, and at the same time have enough parts left to show as load on a truck.